I've been meaning to post about how the Alex Flinn signing I went to went for about a week now! She came to speak at The Little Shop of Stories in Decatur in February. In short, it was fantastic. It was a smaller crowd than I anticipated. I guess not a lot of people wanted to make it out on a chilly February evening. Still, it was really nice to be able to hear her talk in an intimate setting, she's a great public speaker... and the teens who attended all had such thoughtful and interesting questions for her. She read a chapter from her newest book, Cloaked. As I expected, sales of Beastly were quite high... the shelves were wiped out of the original cover version. The new movie cover didn't seem to sell as much. One of the main things that she talked about was how she had read several different versions of Beauty and the Beast, and one of the things that struck her, was in the original, Beauty's father steals a rose from the Beast's garden. When he's confronted by the Beast, he gladly offers to send his daughter to stay in the Beast's castle in his place. Flinn said, that as a parent, this seemed like a fairly horrible thing to do. And the other thing that made her curious was if the Beast is supposed to be the former prince of the land, why is he off in this castle all by himself? Where is his family? Did they just ship him off to a remote castle somewhere to get him out of the way? That seems pretty cold, too. So, she decided Beastly should be about two teens with horrible parents finding each other. What an interesting way to look at it. Of course, plenty of people wanted to hear behind the scenes info from the movie, and she shared plenty of those stories as well. Flinn confessed that she was worried about the film when it was initially put together because she didn't have a lot of creative control with it. But, she was very pleased with what they came up with. The producers had initially cast Zac Efron as the Beast... and Efron had suggested that they change the script so that the Beast is closer to his father, which made Flinn roll her eyes, as the whole point of the book is that they don't get along. But, then, Efron dropped the project, and Alex Pettyfer was brought on board, and they reverted back to the original script. Flinn was also surprised when they cast Mary-Kate Olsen (a famous anorexic) to play the part of the witch, Kendra, who inspires the Beast's scorn in the book because she's overweight. Flinn even wondered if they were going to get a fat suit for Olsen, something which the producers nixed. But, she said Olsen did a great acting job and she was pleased with the results. Someone asked why the Beast in the movie was all scarred instead of furry, and Flinn kind of dodged the question, saying that she understood that Pettyfer was in the makeup chair for hours just to get the scar makeup done, and putting on fur would have taken even longer, so it might have been impractical to do. Privately, I thought the producers must have been going for an "ugly beautiful" look - scary looking, but still with a hint of attractiveness, something which might have been impossible with a hairy Beast. 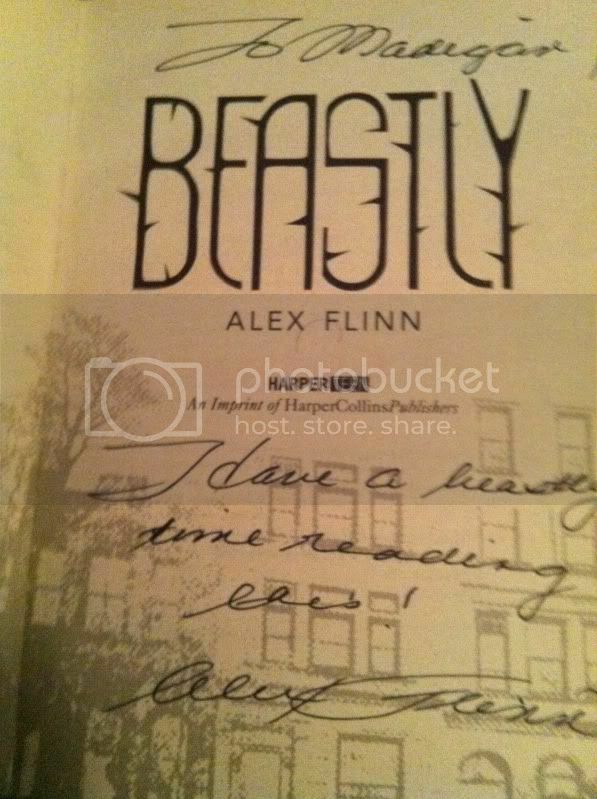 Afterwards, Flinn signed some books, mine is inscribed with, "To Madigan, Have a beastly time reading this! -Alex Flinn" It was a great talk, I'm glad that I went. She really had to love the story to do it a good retelling from the Beast's point of view. I loved this side of the story and can't wait to see the movie. The online chat portions of the book didn't do a lot for me, but I think the movie is going to be really good. Thanks for dropping by The Paperback Princesses. Thought I'd return the favour. I loved this book, and the movie too, so I'm quite jealous that you had the opportunity to meet Alex. I would love it if she'd come to Canada.